Termite barriers and the correct way to install them. Firstly Termite Barriers installed incorrectly puts your home at risk from Termite (white ant) attack and you won't be covered by the warranty. We will tell you the correct way for termite treatments. So your Termite Barrier protection will fully protect your home. If you get termites in this situation you will not be covered by the manufacturers product warranty. it is very important to get it done properly. Make sure you have a compliant termite barrier. 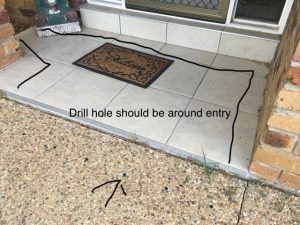 The picture below shows the drill holes did not follow the footing . 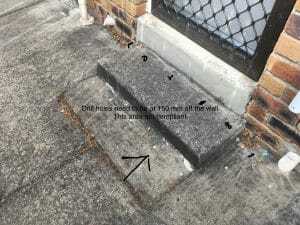 Additionally no drill holes around the front post so these areas are not protected. The holes should follow the black line. 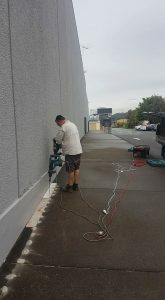 Drilling concrete the holes must be no more than 150mm off the footing and must be no more than 300mm apart . There is one exception if you use Termidor H E they can be 450mm apart. Furthermore when trenching it must go a minimum of 50mm below the top of the footing. Again the drill holes in this picture should have followed the footing. The procedures are part of the BCA building code and must be installed to Australian std 3660.1. This will insure you get the best possible Termite barrier protection. Also Other areas that don't get drilled properly are around water tanks and air conditioner units. In fact water tanks and air conditioners must disconnected and be moved. Then drilled then put back in place. This will cost you a little more but you will have a complete termite barrier protection and will be covered by the manufacturer's warranty. Also We drilled this home and pumped the termidor into the hole we struck actual termite leads under the concrete. live termites were coming out of the hole which doesn't happen very often. You know you are on the right track when this happens and you have been saved from termite attack. When drilling we use drill templates which makes it a lot easier to keep compliant. It also makes it a lot tidier with straight lines . indicating: The termite barrier method of protection. The date the termite management system installed. What areas the chemical system used . Its chemical life as listed on the label. The installer’s or manufacturer’s recommendations for the scope and frequency of future inspections for termite activity. The conditions of the warranty is normally yearly inspections. Also the Treatment installation certificate will have a mud map of the termite barrier areas treated and all warranty info on it. Furthermore make sure you keep all copies of any paperwork for all termite treatments , so when you sell your home you have these documents. Which are very important to the pest inspectors as they can verify the treatments done and give the buyers confidence that the treatment has been done properly. This makes the selling process much easier. Termite Barriers. Trenching and backfilling. Install your barrier correctly and it can save you a lot of headaches and if you are unsure make sure you use an accredited installer as they must install them correctly. So if you need a barrier installed or just want to check it is compliant Give Vicki a call to book in a quote for your barrier on 32008586. All barrier warranties are conditional upon yearly termite inspections. Other services by Certified home services.